The AAMD Object Registry provides access to all relevant information known about our members' acquisitions of archaeological material and ancient art lacking complete provenance after November 1970, the date of the UNESCO Convention on the Means of Prohibiting and Preventing the Illicit Import and Export and Transfer of Ownership of Cultural Property. Art museums regularly acquire archaeological material and works of ancient art - of which objects with incomplete provenance represent but a fraction. 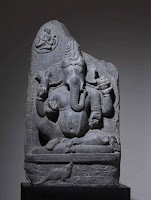 The first piece has now appeared: "Ganesha Stele: an image of a seated Ganesha in high relief, a vidyādhara above his right shoulder and his rat vehicle at his feet" (Portland Art Museum 2008.66). The "provenance information" (i.e. the collecting history) is provided: "Christie’s Rockefeller Center, Sale #2024, 16 September 2008, Lot 377. Sotheby’s New York, 23 March 2000, Lot 139". Where was this piece between 1970 (the date of the UNESCO Convention) and 2000 (the date of its surfacing in New York)? Perhaps somebody will recognise it - after all, that is the point of the AAMD Object Register. New story: D.K. Row, "A study in provenance: Portland Art Museum and its new Ganesha", oregonlive.com, October 31, 2008.